Like the artist’s ability to transform a yellow spot into the sun, great leaders have the capacity to transform a group of individuals into a cohesive team, a hard business into a fluid organization. A cornerstone of this ability to evoke transformation is authenticity. But how do you identify those leaders? When the word “authenticity” first entered the boardroom lexicon, it signified a new breed of leadership. It echoed the possibility of a more human element entering business. But talk of authenticity among leaders began to precede practice, and an overly simplified definition of the term came into popular use. The actual practice of authenticity in leadership requires tremendous effort, fortitude, and a willingness to engage in trial and error. Because of this, finding leaders who are truly practicing authenticity can feel elusive—even impossible at times. It is dedicated practice, rather than preaching, that sets these two groups of leaders apart. 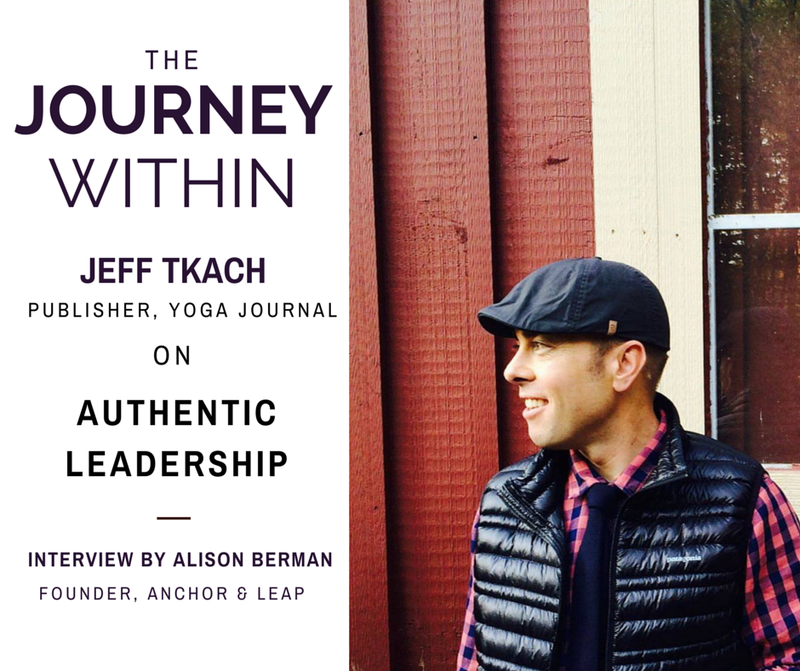 Yoga Journal’s Publisher Jeff Tkach is determined to bring mindfulness, meditation, and humanity into the office; to introduce a more sustainable rhythm to our workplaces, one that emphasizes the spirituality to our work—the why we do what we do. Jeff lives with his wife Jackie in Boulder, Colorado and is completing Naropa University’s Authentic Leadership Certificate Program. The practice of self-inquiry, however, has been a core element of Jeff’s daily life for nearly two decades. Prior to Yoga Journal Jeff was the Group Publisher of Climbing Magazine and BackpackerMagazine and gained his roots in media at Rodale, Inc.’s Organic Gardening Magazine where he worked for seven years, and as Publisher for the last two. Alison: How do you personally define authentic leadership? Jeff: I don’t want to use cliché language, but I think it is to be your true self in all settings including at work. On a deeper level, I think authentic leadership is a willingness to go beyond the norm, to get out of your comfort zone and go the extra step to be the most loving, kind, patient, inspiring person you can possibly be, and amidst all the chaos. It takes a little more to be an authentic leader, it takes a lot more actually, and I think you don't ever get it fully right, but you strive for it. Alison: Leadership is a largely discussed subject right now. What specifically attracted you to a program on authentic leadership? Jeff: I feel like there is a real need in corporate America, in our professional lives, for bringing our whole selves to the workplace. I think that there is a lack of this in many places. We work in a culture that is moving way too fast and the pace at which corporate America is being forced to operate at is not sustainable. It’s not sustainable to our marriages, to our personal lives, to our families, to ourselves, to our health, to the environment. And I think that our speed is causing us to make a lot of mistakes and to do a lot of damage. When I say speed I mean not just the pace at which we work, but the lack of a real sustainable rhythm to our work cultures and our places of work; the demands we are asked to do, the margins we are being asked to make, the bottom line mentality that is so pervasive. I think that what is missing is the spirituality to our work, the beauty, the why we do what we do. I want to be part of a movement that brings more of that into our places of work. And that is really what the program is all about. Alison: During the program at Naropa, has there been a myth about leadership that has been dispelled? Jeff: I’m not sure that there is any one in particular that I can identify with, but I think what the program has done for me is that it has given me reassurance that the kind of leader that I want to be in the world is possible in the corporate setting, and that the ideas that they are bringing forth can be implemented. For example, one of the things we talk about is mindfulness and meditation and how that can actually help a leader to be more present with his people and how that can really change the whole dynamic. One of the things I do now is at the beginning of every meeting I do a moment of silence and pause. If you look at anyone’s Outlook calendar, every 30 minutes there is a meeting, and that rhythm becomes so unfocused. How much are you really listening after you just sat in a meeting right before? So I think the myth that has been broken down for me is just that it can be done. Alison: So much has changed in the world of business even just in the past year. What do you think is a quality that is absolutely critical for an authentic leader today? Jeff: Love. I love the author Tim Sanders; he wrote a book called, Love is the Killer App. He wrote the book about 10 years ago and he was an executive at Yahoo. His theory is that if you can literally focus on love, and in all forms, take that word for whatever it means, true compassion, presence, all the things that are adjectives of love—and bring that to work, that is what is game changing. A lot of people are afraid to do that because of how they might be perceived or the kind of humility that it takes, but I think that is what we are all striving for. Jeff: A couple things. For me, it has to start with my own personal health. When I am doing good self care, when I’m exercising, riding my bike, getting good sleep, eating properly, and I feel good, then I show up and I am my best. But I also think another dynamic is when my team really feels my support—when they are flowing, when they are feeling supported and feeling that love, when they are feeling inspired, and we are all flowing, I think that is the perfect formula. Alison: Susan Skjei referenced the Dalai Lama’s remarks on leadership, explaining one of his main points: we can talk about leadership and how we should be, but the time we really know who a leader is, is during a time of challenge and who we become during those times of challenge. What are your thoughts on this idea? Jeff: I think that you really discover a lot about who you are when you have to lead through adversity. It’s funny because my wife actually said something to me this morning, which is both related and unrelated. Alison: What has been a failure that you have experienced that with hindsight, you see was critical to your development and journey? For a bit of context, this is a question I’m asking in multiple interviews to see how our perspectives on our “failures” evolves as we move beyond them. Jeff: The job that I took when I came out here to Boulder was to be the Group Publisher of two outdoor brands, Backpacker Magazine and Climbing Magazine. And honestly, year over year, the number did not improve. I was in that job for one full year and it was really hard for me because I am a performer. I am used to delivering the number, I’m used to showing growth, and in this case I gave it all I could, I really did, and it has been a hard pill for me to swallow. My company still promoted me, which is humbling, and I got moved into a bigger role, and a role that is more me. But I still struggle with, “Wow, I wish I could have improved that.” But in reality, that job taught me so much about myself that it wasn't a failure. There is a euphemism that says that you fail forward and I think that in hindsight, it really didn't matter that I didn't make those numbers. I did improve the culture and the spirit, and helped build that into the people that I worked with. And in hindsight, that is a win. Alison: Throughout your professional journey have there been specific people or experiences that have inspired the path you have taken? Jeff: I’ve read a lot of Bob Rodale’s work and always felt that he was such a visionary and very fringe and unconventional when it came to health and health wisdom. He definitely inspired my personal life behaviors and practices. In terms of career path, I was fortunate to have some good mentors at a pretty young age who built in to me to follow my passion first and to never compromise putting your passion with your profession. And that has been my guiding light. I have taken a couple of turns where I followed new opportunities or financial gain, and they never really went that well. I’ve always been at my best when I couple passion with profession. Alison: Is there a project at Yoga Journal at present that you are particularly excited about? Jeff: A couple. It is going to be our 40th anniversary this year over at Yoga Journal. Yoga in America has gone through a lot of evolution and iterations over the last 40 years, and the larger global yoga community often criticizes the way that Americans do yoga because we have commercialized it so much. In a lot of ways, there is almost this dishonest kindness to a lot of people who practice yoga—I don't feel like we really embrace selfless service. The Sanskrit word is Seva and that literally means selfless service. So we are launching something called the Good Karma Awards in our 40th Anniversary issue in September and we are going to honor 13 people who are using yoga to do good in the world. These are people who are truly taking yoga off the mat and doing good, doing service. We are hoping that this is a point of inspiration for our audience to do the same thing. Alison: Is there an accomplishment in your life that you feel most proud of? Jeff: Getting married. I waited a long time to find the woman I chose to marry and I was really intentional about that. I also had to do a lot of work on myself to get to a point where I was ready to be with a person like that. I think that marriage is probably the most incredible discovery of my life. And I think that it has only added to my life. It took a lot of work to get here and stay patient and wait for the right person that I knew would help me become the best version of myself, but it was worth the wait. Alison: Wow, congratulations on that! Jeff: How is that for sappiness? Alison: It is perfect; it is completely authentic! Alison: The last question I want to ask is whether there is anything we have not talked about that you would like to cover? Jeff: When you were asking me and I was riffing on what makes me who I am and how do I show up and be my best at work. Spiritual practice has been a huge part of my life for my whole adult life. I don’t want to go too “wooey” on you but I do have a daily ritual, where in the morning I do find silence, solitude, meditation, whatever you want to call it, and I definitely carve out 15 minutes or so a day to journal or to read something spiritually provoking. I’d say that that has been one thing that has always been a constant for me and I feel that that is my foundation. That would be my one little secret ingredient that I would love to share. Alison: Do you adhere to that on a daily basis? Jeff: Everyday, yes. Every single day. There have probably been less than 20 days in the last 15 years where that doesn't happen.